All my life I’ve had a love-hate relationship with, of all things, my own name. To be more precise, my relationship with my name is about ¼ love and ¾ hate, and the “love” is more on the order of “like” similar to the manner in which you “like” a comment on Facebook primarily because it has no misspellings. Now you might think I have an archaic moniker like Bartholomew, an androgynous one such as Skyler, a back-to-the-garden 60’s name like Moon Glow, or an aberrant flight of parental reason like Melrose. 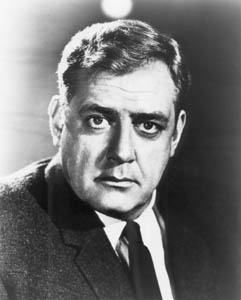 • Perry White, Clark Kent’s 'Great Caesar’s Ghost' spouting editor, the man who holds the distinction of being the only nonessential character ever woven into the entire Superman legend and the only one never to get his own comic book. If you’re a bit younger, you may know rocker Perry Farrell, actor Perry King, or designer Perry Ellis. But frankly if you held a convention of Perrys you could fit them all in a Hampton Inn and still have room for a Starving Artists' Sale. If you took all the Perrys in the world and laid them end to end, they’d be thankful for the attention. 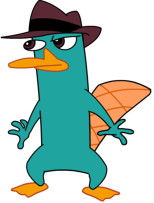 I myself have only known one other Perry. And in that experience I learned that I am wholly unable to handle something that people named Jim and Bill and Bob and probably even Bartholomew each and every day negotiate with ease. I cannot address another human being by the very name I’ve felt saddled with my entire life, but which I’ve also come to feel I own! I sputtered over the phone the first time I called Other Perry, slurring our communal name so badly it sounded like I was summoning a Pekingese for his nightly brushing and toenail clipping. To avoid saying “Hello, Perry, this is Perry,” I --- a person alive and breathing in 21st Century America --- actually uttered the word “namesake.” What would be next? Babbling to him to “leadeth me in the paths of righteousness for our namesake” as well? Truth is, how we relate to our names oft does define our identities. Call your daughter Bertha and chances are by the time she’s 23 anyone lacking a full-blown death wish will opt for the stairs whenever she heads for the elevator. Christen your daughter Tiffany or Angelique and odds are she’ll grow up to never even consider dating a Perry, let alone me. But when it comes to the Semi-importance of Being Perry, there's just no road map. I don't know what a Perry is, what a Perry does, or what a Perry ought to be. I need some Perry pointers and fast! Or at least, Perry Passability. I promise not to call you Namesake. As long as you promise not to call me Pouie! Your name makes me think of that cartoon fawn, too cute for its own good, advertising Babycham, the genuine Champagne Perry! This was a spectacularly girlie UK fizzy alcoholic drink, asked for by naive young women who wrongly imagined it made them appear sophisticated when out on a date. A fawn named Perry. Too cute for its own good. Now I really hate my name! And I'm not particularly fond of you! You could use it as a chat up line. "Hey, I'm Perry - the genuine Champagne Perry..."
Just as good as, "Bond. James Bond," in my opinion. Maybe better. I have always liked the name "Perry." Maybe you should move to the Ozarks where the name isn't so unique. Until last year I worked with Perry Gaither. My brother owned half-interest in a lumber company with Perry Posey. One of our leading citizens was Perry Harness. There is a street in a very nice neighborhood in our town called, Perry Street. I repeat: I like the name. It's not overdone like Jason, Ethan, Evan, Trevor, & Tyler, all of which I am perfectly tired of and if my girls ever give birth to any or all of the above, I'm petitioning the courts for a grandparent's right to change names. Consider the name "Kathy." No longer does that name conjour an image of a cute blond cheerleader. No, sir. These days, you hear "Kathy" and you think of some fat, gray-haired woman waddling around Walmart in flipflops and capris. Kathy will soon go the way of Bertha, Beulah, Gert and Mabel. Why do you think I prefer K.D.?? I wish my name was Lexi, or something cute. Just one problem: I don't happpen to live in the U.K. Don't think your chat up line will play that well in Peoria. I agree that Lexi is a very cute name. But poor Lexi Revellian! Last week she was required to change her name to Agnes Revellian. Seems they have the same laws about age limits on cute names in the U.K. as they do here. I like the name Kathy; I've been dumped by my fair share of Kathys. They usually do it without grinding stiletto heels into your abdomen. Yes, indeed, a fine name. I'd had no idea Perry was such a prominent name in the Ozarks. Maybe the three Perry's you mention could give me some insight into my name. Then again if it involves buying a trailer and marrying my sister, I'll respectfully pass. Now here's a wonderful phrase: "an aberrant flight of parental reason..." Love it! 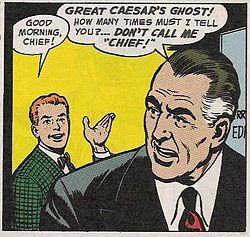 Great Caesar's Ghost, I never caught that!